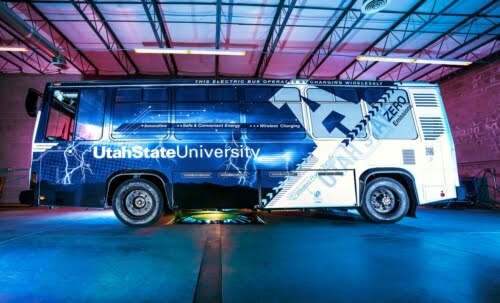 The Aggie Bus rolled onto the streets carrying passengers just 16 months after USU demonstrated the first high-power, high-efficiency wireless power transfer system capable of transferring enough energy to quickly charge an electric vehicle. In July 2011, the USU Research Foundation demonstrated 90 percent electrical transfer efficiency of five kilowatts over an air gap of 10 inches. The demonstration validated that electric vehicles can efficiently be charged with wireless technology. USU’s Wireless Power Transfer team, in cooperation with the Utah Science Technology and Research initiative’s Advanced Transportation Institute at USU, has designed a more efficient way to meet the nation’s transportation needs. By carefully applying a mix of modern advances in engineering and Nikola Tesla’s principles of induction, USU engineer Hunter Wu and his team have solved one of today’s vexing problems in WPT. Their research has led to the development of a robust prototype, which has been fitted to the Aggie Bus. 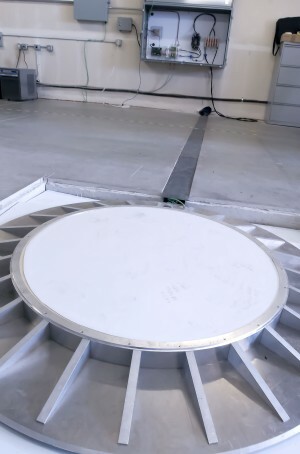 The prototype transfers power over an air gap where no physical contact is required. Wireless power transfer technology delivers a multitude of benefits to consumers that include greater reliability due to no moving parts or cords, added convenience through the elimination of plug-in charging, the assurance of safety by removing the risk of electrocution and aesthetically pleasing devices as a result of no visible wiring. WAVE Inc., a Utah State University spin-out company, worked in cooperation with the USTAR Advanced Transportation Institute to develop the Aggie Bus. WAVE tackles the problem of heavy and expensive electric vehicle batteries through wireless power that transfers electricity between vehicles and the roadway. The Aggie Bus represents a market-ready product that will be used to retire significant technical risk as WAVE moves onto full-scale projects next year. WAVE, in partnership with the Utah Transit Authority, will launch its first commercial demonstration in mid-2013 on the University of Utah’s campus. It will feature a 40-foot transit bus on a public transit route and an increase in wireless power transfer charging from 25 kilowatts to 50 kilowatts. The project has been funded by a $2.7 million TIGGER grant from the Federal Transit Administration and the University of Utah which purchased the bus. WAVE intends to deliver a commercially ready product that operates with the same reliability as current public transit bus options, including diesel and compressed natural gas buses.